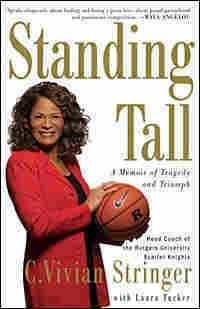 Rutgers Coach Offers Lessons on 'Standing Tall' C. Vivian Stringer, head coach of the Rutgers University women's basketball team, discusses her 800th career game win, bouncing back from Don Imus' racial slur against her team, and her autobiography Standing Tall: A Memoir of Tragedy and Triumph. 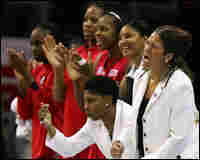 Head coach C. Vivian Stringer (far right) celebrates with her players after winning the semifinal game in the 2007 NCAA Women's Final Four. C. Vivian Stringer, head coach of the Rutgers University women's basketball team, discusses her 800th career game win, bouncing back from radio host Don Imus' racial slur against her team, and her autobiography Standing Tall: A Memoir of Tragedy and Triumph. 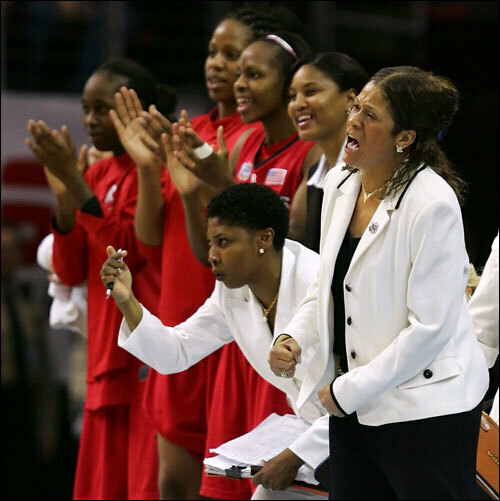 "I am the last stop before the young women I coach take their place in society," Stringer writes, "and it is a responsibility that I take seriously. My goal is to give them the confidence to dream big and the skills to overcome any challenge they face, whether it's under the basket or in the boardroom." Stringer talks with guest host Robert Smith about the challenges she has faced — from fighting for a spot on an all-white cheerleading squad, to the unexpected death of her husband, to her own struggle with cancer. 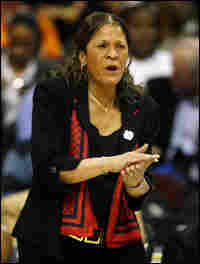 She is a member of the Women's Basketball Hall of Fame and has been named National Coach of the Year. Bill and I got married in September 1971. We had waited a long time–five years–and had gotten to know each other really well. I always wanted to be out and doing something, and Bill was game for whatever I wanted to do. Interestingly, Bill was nothing like the stereotype of the black male athlete. He was an amazingly talented gymnast and a fantastic volleyball player, and, like me, he played field hockey in a league. He'd been awarded a dance scholarship to UCLA. But basketball? No. I think I was a better basketball player than he was; in fact, I know I was. We were pretty evenly matched otherwise, though. We'd put our tennis rackets on our bikes, pack a picnic, and go out to spend the day together–just a girl and a guy doing ordinary things. Part of the reason we took so long to get married had to do with the way I was raised. My father preached independence for women long before it was fashionable to do so. There was no way any of the Stoner girls was going to marry a man because she was looking to be taken care of; my father would have found that revolting. We had to be in control of our own lives. He had a way of making fun of me or my sisters if we ever looked like we were too dependent on someone. You never wanted him to catch you waiting for a boy to call, for instance; he'd tease you until you cried. My mother didn't get involved in the emotional ups and downs of being a young person, either. She just wasn't that way. We've all talked about that since then; I'm not sure it's a great idea to make your kids feel embarrassed for showing emotions or getting attached. I know that I never felt like I could share real disappointment with my parents, and neither did my siblings; we had to be strong and act like everything was fine. I'm sorry to say that I got a little of that from them. I sometimes wish that I'd been more affectionate with Bill. We held hands all the time, and there's no question that Bill knew that I loved him, but I probably could have been more expressive. In later years, I think sometimes I hugged and kissed our boys all the time as a substitute for how much I wanted to hug and kiss Bill. To this day, I'm not sure whether Bill proposed, or whether I did. I wouldn't be surprised if at some point I just said to him, "Why don't we get married?" Since the early days of our relationship, he'd talked about what our lives would be like when we were married, so making the decision was nothing dramatic. But once we had decided, he visited my father to ask for my hand. Bill knew that when you got engaged to one of the Stoners, you weren't just marrying one of us; you were marrying the whole clan. Everyone had to be in agreement. Everybody in my family got along with Bill; they respected him. As anybody would tell you, "Bill Stringer is about truth." If you wanted to get the whole, unvarnished truth about something, you could ask him, and he would tell you. He would be gentle, but he would be honest. Bill was very different from my father, but there were some things that they had in common. Both of them were very solid and dependable, and both shared a real ease with people and a real interest in them. I used to say that either of them could be equally comfortable sitting down with the winos on the corner or having dinner with heads of state. They just had that kind of touch. After Bill had spoken with my father, he surprised me during Christmas with a little star sapphire ring with two itty-bitty diamonds on the side. When he gave it to me, he told me, "I want to spend the rest of my life with you. I don't have any money or anything to demonstrate that I can take care of you, but I promise you that I will." He wanted me to know that he was just starting out, and that this little tiny stone wasn't going to be it! I didn't care about the ring; it was what it meant that mattered. Our usual church in Edenborn was too small, so we had the ceremony at a church in Uniontown. My cousin Marian Stith Lowe planned the wedding. We were surrounded by people we loved, and my sisters and my two best friends were in my wedding party. It made me so proud to see my college coaches and colleagues there. We had always loved the way our friends Thelma and Otis sang "Bridge Over Troubled Water," so we asked them to sing it during the ceremony. I remember standing at the back of the church, looking at Bill, and thinking that I couldn't believe this handsome, stately man at the end of the aisle was going to be my husband. My dad was back there with me. Even with his prosthetic legs, he still managed to walk me down the aisle. He was a jokester; he never stopped teasing us, and my wedding day was no exception. We were standing at the back of the church, looking down the aisle at all those people waiting for me to start walking, and my dad says, "Okay, now. You don't have to get married; we raised you young ladies to take care of yourselves. If the ship starts sinking, the rats start running. Which way are you going? Last chance, what are you gonna do?" I looked at him and said, "Let's go." "If you're happy, I'm with you one hundred percent," he said, and we started down the aisle. My mom and my family sat to my left, and everyone–me included–was crying so loud you would have thought it was a funeral. It was only then that I really understood the significance of what I was doing. It's strange, but I almost felt like I was breaking up our family. We had always been together, and now we wouldn't be, not in the same way. There was someone else now. After the reception, which was held in Uniontown, Bill and I went back to my parents' house. It was the oddest thing: I didn't want to go inside. It felt like an ending to me. I kept thinking, This is the last time. I won't ever be able to return here in the same way. My father was not an affectionate man. You always knew that he loved you; none of us ever doubted that for a minute. But you knew he loved you because he did things that showed that he loved you, not because he told you he did or because he hugged you. If there was crying or kissing on television, he'd always joke about it: "Oh, geez, here we go with all that soft stuff." On my wedding day, I found myself standing at the top of the stairs, thinking about how badly I wanted to hug my father. I wanted to tell him how much I loved him, and it felt like this was my last chance. So I said to myself, "I'm going to count to twenty, and when I get to twenty, I am going to walk down these steps and run right up to him and give him a hug and tell him that I love him. That is what I am going to do." I will tell you, I was shaking as I walked down those stairs, but I didn't give myself enough time to think. I just went right over to him, put my arms around him, hugged and kissed him hard, and said, "Dad, I love you." He was so shocked! There was genuine surprise on his face, and tears in his eyes. He had four daughters, and we all idolized him, but he always had to be the strong, John Wayne kind of guy. I thought, All this time, all I wanted to do is hug you. Why didn't you just let us love you? I wished I'd done it before, but I was grateful to have been able to tell him that I loved him on my wedding day. That night Bill and I left on our honeymoon. He didn't tell me where we were going. That wasn't unusual for the times, when it was pretty common for the honeymoon location to be the groom's surprise. It was definitely not unusual for us; Bill was always in charge of things like that in our relationship. And he had a surprise in store for me. At the time that we got married, I was playing in a pretty serious amateur softball league. Bill and I both played in a field hockey club as well; it was a way to continue to play even after our collegiate careers were over. It happened that this particular year, my softball team, the Pittsburgh Orioles, had made it to what was called the World Championships, and wouldn't you know it, the championship game was being played in Williamsburg, Virginia, the day after our wedding. I never mentioned this to Bill. Who would have guessed, when we were choosing our wedding date, that my team would be playing for the championship? There was no way of knowing; it was just the way it worked out. And once I found out, there was no way I was going to say anything. What was I supposed to say? "I know we've got this whole wedding thing planned, but there's this softball game I want to go to?" At the same time, I couldn't help it: I really, really wanted to go. Stop it, I told myself. A championship softball game might be a once-in-a-lifetime opportunity, but guess what–so is getting married. And you're getting married, Vivian, you're not playing softball. So I never breathed a word of it to Bill. To this day, I don't know how he knew. But he knew that as soon as the car started moving down the highway, I'd be out like a light. We got to the hotel in the middle of the night and checked in; I never asked where we were, and I barely opened my eyes. The next morning, our first as husband and wife, we got up to go out for breakfast. Again, I was in the passenger seat and not paying much attention until suddenly I realized that we'd stopped in a parking lot. I turned to him in confusion. He just smiled and said, "Are you kidding me? I know how much this game means to you." At that point, I still didn't really understand what was going on. I turned around and saw my softball uniform, all clean and laid out in the backseat. I looked back at the field, and sure enough, I saw our team banners. I was speechless. Bill saw how stunned I was and tried to loosen me up. "Hey, I got your uniform and everything. I think you need to get out there to get some practice, don't you?" So I got out of the car, but it still felt as though I were dreaming. The whole thing, even now, is a blur. I felt embarrassed; I had no business in the world being on a softball field that day–it felt like the most selfish thing in the world. I was wearing a white blouse and I still had my wedding hairdo–all these little curls all over my head. I couldn't walk out onto the field. I just stood there, looking at Bill, unable to move. He saw the look on my face, and I knew that he understood. Then he did something that I will never forget as long as I live. Very gently, he said to me, "Come on. I've got my glove too." I've got my glove too. And so the two of us stood there on the sidelines, throwing the ball to each other, while I got warmed up. So that's how, the day after I got married, I played in a championship softball game. This is why I say that I know what it means to be supported at the ultimate level. There aren't a lot of guys who would have made that sacrifice on that particular day, but Bill drove all night–on our wedding night–to get me to a game I cared about. That day it seemed like every single thing was right in the world. When I finally got out onto the field, my team was surprised and happy to see me, although my coach, Mr. Johnson, claimed he knew I'd be there. You better believe they teased me about that hairdo, too. And no, we didn't win. That was just the kind of thing Bill did. He wasn't the type to scatter rose petals on your bed, but he had a way of making a gesture that showed he knew you, the kind of gesture that would blow the guy who was sending you ten dozen roses right out of the water. I remember once, when we were in Iowa, he bought me a pair of footie pajamas. "What were you thinking, getting me those ugly flannel things?" I asked him. Very calmly, he said, "Vivian, you know your feet are always cold, and now they won't be." Excerpted from Standing Tall: A Memoir of Tragedy and Triumph by C. Vivian Stringer with Laura Tucker. Copyright © 2008 by C. Vivian Stringer with Laura Tucker. Excerpted by permission of Crown, a division of Random House, Inc. All rights reserved. No part of this excerpt may be reproduced or reprinted without permission in writing from the publisher.